It was a summer evening at the Dead Sea. The wind breathed fire, but with every passing hour the air grew calmer and the temperature dropped. Masada, rising 1,400 feet, loomed in the background, lamps casting an eerie glow on the mountain’s bulk. Nabucco onstage at the foot of Masada. A reception area at the foot of the mountain, with low-slung tables and couches and faux-marble columns, created the illusion of a Roman palace (crossed with a big Israeli wedding site). The guests, reclining comfortably as they sipped drinks and nibbled hors d’oeuvres, could imagine they were Roman aristocrats—perhaps invited by King Herod, whose grand palace graces the northern face of Masada—awaiting a theatrical spectacle. And what a spectacle it was. 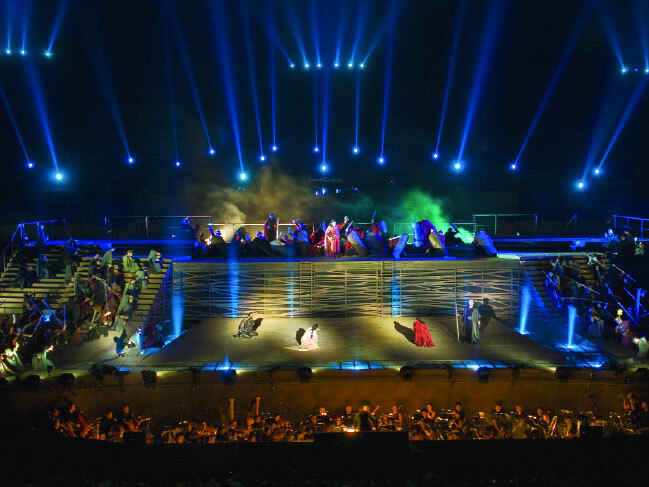 To mark the Israeli Opera’s 25th anniversary in June 2010, the company launched a new musical experience—opera at Masada—with Giuseppe Verdi’sNabucco, complete with lightning, fire, rivers, dozens of searchlights, chariots, 10 horses and 2 camels. More than 50,000 people, including 4,000 tourists who had come just for the opera, saw the Masada performances, which also included a gala concert by soprano Jessye Norman. Following that success, the Israeli Opera decided to make opera at Masada an annual event, staging Aida in the first two weeks of this month (Carmen is scheduled for 2012). 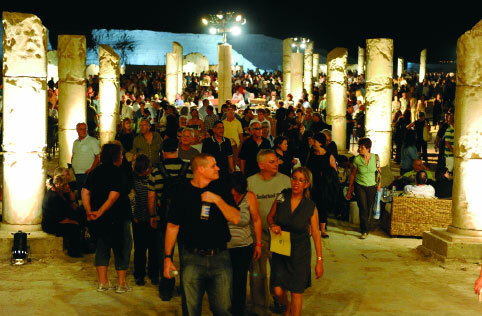 The opera festival extends to the capital, where it will include Verdi’s rarely performed opera Jerusalem and his Requiem as well as 30 chamber and vocal concerts in dramatic historical settings (www.opera-masada.com). And last April, divas from the Israeli Opera company promoted Aida by serenading the city with classical arias from the Jerusalem Chords Bridge. Performing outside the opera’s Tel Aviv home is a big enough challenge, but staging an opera at the foot of Masada—where normally there is nothing but parched earth and rocks—is a monumental endeavor. The Dead Sea, the lowest dry-land place on Earth, is in a desert region that is blisteringly hot much of the year. Setting up 6,500 tiered seats, a complex lighting system and an LCD display for Hebrew and English supertitles is just one step. For Aida, the challenge is greater because it is a larger production than Nabucco; the orchestra is bigger and the chorus is bigger, he said. The stage is three times the size of the company’s Tel Aviv stage, and Aida will have a “huge set,” with sphinxes and obelisks. Aida is also an opera of vast contrasts, between the triumphal march in Act II and Act III, in which only three people are on the stage. “These three people singing before 7,000 people have to create a sense of intimacy and yet be part of a grand show,” Ajzenstadt explained. Last year, 40 tons of equipment had to be trucked in over winding roads. Transportation for guests had to be arranged from major cities and Dead Sea hotels. And a parking lot the likes of which had never been seen at Masada had to be set up. This year, everything will be on an even larger scale. “When you have so many people on the stage, you have to have a huge number of people backstage to take care of them,” Ajzenstadt said. The performers include many dozens of extras, but also opera stars from around the world who are not used to living in tents. “We are building a backstage opera city; the infrastructure is as complicated as the physical production itself, if not more so,” he said. Every aspect of the performances requires special thought. For Nabucco, gowns for the chorus were made of cotton so that they could absorb sweat and provide ventilation, said wardrobe head Galia Lichtman, and they had to be laundered nightly at a nearby kibbutz. 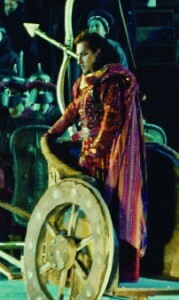 For Aida, the costume designer chose even lighter and breezier fabrics, even when they must create an illusion of weight. Makeup, too, requires extra thought, even though stage makeup is designed to withstand hot stage lights. The body makeup was the greatest challenge, said Anat Yaron, the opera’s head of makeup and wigs. Performance-goer move through a reception areas set up like a Roman palace. “We used extra-durable makeup and as few coats as possible,” she said. Even so, many touchups were needed during the performances. Last but not least is the attempt to engage local communities, 2,000 of whose inhabitants—some of them Bedouins—were involved in the production ofNabucco. This year, in addition, 60 Bedouin dancers will perform the dance of the Moorish slaves in Aida. An open-air performance at an historical site was the fulfillment of a long-held dream of Israeli Opera’s general director, Hanna Munitz. 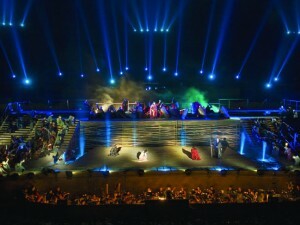 And Nabucco, with its historical setting, was the perfect choice for the premiere at Masada. The opera opens with the destruction of the First Temple in 586 B.C.E. and the exile of the Hebrews by the Babylonian king Nabucco (Nebuchadnezzar). Some 650 years later, Masada was the site of the Jews’ desperate last stand against Rome, following the destruction of the Second Temple in 70 C.E. and the second exile of the people from their land. Today, Masada is a UNESCO World Heritage Site where one can see the fortress that Herod built atop the mountain, the storage areas and water cisterns that enabled the Jewish rebels to hold out for so long and the remains of the Roman siege system. “The combination of this very Jewish topic with a site that symbolizes the heroism and sacrifice of the Jewish people is obviously more than exciting,” Munitz said. Nabucco’s “Va, Pensiero, Sull’alli Dorate” (Fly, thought, on golden wings), the song of the Hebrew captives in exile yearning for their home, is one of the best-known operatic melodies of all time. A thrill passed through the audience as the chorus began with almost a whisper and then rose to a mighty cry of anguish and hope. If it was kitsch, if it was a lowbrow appeal, it worked its magic. The audience was ecstatic, and so were the critics.Jerusalem Post music critic Ury Eppstein found the Israel Symphony Orchestra Rishon Lezion and the opera choir the most impressive aspects of the opera. What inspired Verdi’s Nabucco, Jerusalem and Aida, all three of which are in the grand opera tradition, filled with spectacle and set in exotic places? Nineteenth-century archaeological discoveries in Egypt were one factor. Another was the Exposition Universelle in Paris in June 1867, to which Isma’il Pasha, the Ottoman viceroy of Egypt, came to show off attractions of his country in an elaborate pavilion complete with a temple. Though it is often said that Aida was commissioned for the opening of the Suez Canal two years later, in fact it was commissioned by Isma’il Pasha to enhance his image in the West as a patron of the arts and to provide a spectacular work based on an Egyptian story for his new Cairo opera house. The opera’s plot is based on a romance by archaeologist Mariette, who had designed the temple for the Egyptian pavilion, and Verdi himself worked on the libretto with Antonio Ghislanzoni. The opera premiered in Cairo in December 1871 and at Milan’s La Scala in February 1872, and quickly became a hit worldwide. The plot concerns Aida, an Ethiopian princess enslaved in Egypt, who is torn between her love of Radames, commander of the Egyptian army who is sent to fight the Ethiopian invasion; love of her homeland; and love of her father. Amneris, the powerful daughter of the Egyptian king, is Aida’s rival for the love of Radames. Aida’s father, whom Radames captures, manipulates his daughter into getting her lover to divulge the army’s battle plan. When Amneris discovers this betrayal, Radames is sentenced to be buried alive. Aida chooses to die with him. The Grand March with its blaring trumpets and crashing cymbals, from Act II, is perhaps one of the best-known pieces of operatic music, and the Act III “O Patria Mia,” in which Aida yearns for the homeland she will never see again—“Oh my beloved homeland,/ never more,/ never more,/ will I see you”—is one of the best-loved arias. This theme of yearning for a homeland spoke to Verdi’s countrymen who wanted to throw off the yoke of foreign rule and achieve independence. The composer was often said to have been the hero of the Italian Risorgimento, the unification of Italy, but the supposed patriotic references in his librettos were apparently just part of the Verdi myth. In the Masada production, Daniel Oren is again conducting, with soloists including Micaela Carosa and Marco Berti, the Israeli Opera chorus and the Israel Symphony Orchestra Rishon Lezion. The lighting is by Avi-Yona Bueno, who created the lighting effects for Nabucco. Following the six performances of Aida, the Masada events conclude on June 12 with Italian tenor Andrea Bocelli, in a gala program of arias and Neapolitan and popular songs. Bocelli, whose signature song is “Con Te Partirò” (released also in a partly English version as “Time to Say Goodbye”), is said to be the biggest-selling solo artist in the history of classical music. While all that is happening at the Dead Sea, the festival in Jerusalem opens with a semi-staged production of Verdi’sJerusalem, an opera in four acts set during the Crusades to the Holy Land. It opens in France in 1095, moves to the city of Ramle and finally reaches Jerusalem, where the Crusaders are about to capture the city. As in Nabucco and Aida, the suspenseful plot involves a love triangle, complex relations between a father and daughter, tested loyalties and hidden identities. David Stern, music director of the Israeli Opera, is conducting, and the soloists include tenor Scott Piper, soprano Ira Bertman and baritone Roberto Serville. The concluding musical event in Jerusalem will be Verdi’s Requiem, performed by the orchestra and soloists of the Arena di Verona, Italy’s leading summer opera festival, conducted by Giuliano Carella. The soloists are soprano Svetla Vasileva, mezzo-soprano Mariana Pentchava, tenor Stefano Secco and bass Louis-Ottavio Faria. As part of the festival package, tourists are receiving a 20-percent discount on various attractions and special prix fixe menus at restaurants. The Masada events are also aimed at promoting the Dead Sea in the New 7 Wonders of Nature online global campaign, at www.new7wonders.com or www.votedeadsea.com. The Dead Sea, one of Israel’s top tourist sites, has already reached the finals in the competition, and the seven winners are to be announced on November 11. Meanwhile, the music and spectacle of Aida will transport the audience to a glorious, imaginary Egypt, as a grand romance unfolds, engaging the eyes, the ears and the heart.